Here at Cloudigy, we enjoy chocolate trademark stories. So we wanted to share a heartwarming story about several recent chocolate trademark litigations in Europe. Swiss chocolate maker Lindt cares a lot about chocolate bunnies that are wrapped in gold foil and sport red neck ribbons. After all, these bunnies come from an old chocolate-making tradition. In 2001, Lindt [trademarked its golden bunny], then sued German confectioner Confiserie Riegelein for trademark infringement, hoping to push the family-owned rival out of the gold-wrapped chocolate bunny market. Both companies have been making similar chocolate bunnies since at least the 1950s. Finally, this 12-year bunny brawl has come to an end. At the end of March, Germany’s Federal Court of Justice rejected an appeal by Lindt & Spruengli after a lower court determined that its bunny is not distinctive. In trademark parlance, that means that it’s not worthy of the special trademark protections for source-identifying product characteristics. Now the German courts don’t have to decide whether bunnies that are wrapped in different shades of gold or those that lack classy red bows are still likely to confuse consumers. This isn’t Lindt’s first bunny trademark battle. This ruling is a follow-up to the EU Court of Justice decision denying Lindt’s attempt to register a Community trademark on the famous Lindt foiled bunny with a bow. That court said that the bunny was devoid of distinctive character, i.e., Community trademark application REJECTED. 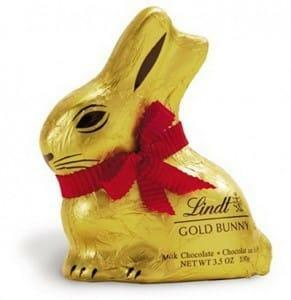 However, to date, Lindt has registered its bunny trademark in 15 out of 25 EU member states. And in related news, last year a German regional court ruled that Lindt’s chocolate bear wrapped in gold foil with a red ribbon is a visual representation of a gold bear. Unfortunately for Lindt, ‘gold bear’ is the trademark name under which packets of multi-colored Haribo gummy bears are sold. But Lindt seems to be getting some love in neighboring Austria, where a family-owned rival confectioner can no longer produce gold Easter bunnies with yellow bows around their neck. Go figure. Now it’s your turn: do you identify certain animal shapes and dressings with a particular chocolatier? Pay Me for My Magic Soybean Seeds!